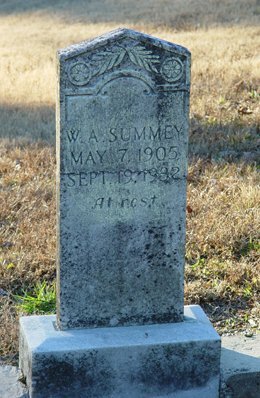 William Andrew Summey, son of William M. and Sallie Blackburn/Blackman Summey, husband of Lola Evelyne Knight. Original tombstone (seen above) was replaced. William Andrew Summey, 25, was found dead in his bed at the home in the Stamp Creek district, at noon Monday by his wife, Mrs. Lola Knight Summery. Mr. Summey had been slightly ill but his condition was not known to be serious. A coroner’s jury composed of the following gentlemen empanelled by Coroner G.W. Hendricks returned a verdict of death from natural causes: Messers. A.F. Kown, Deputy L.L. Grizzle, C.J. Shinall, E.S. Gentry, J.W. Young and F.H. Hendricks. 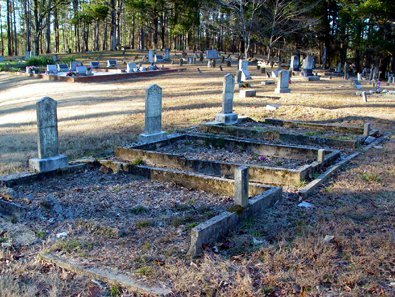 In addition to his wife, the deceased is survived by three small children, Grady, Elson, and Dorothy Louise, and his parents, Mr. and Mrs. Will Summey, of Acworth. Friends of the family sympathize with them in their bereavement.